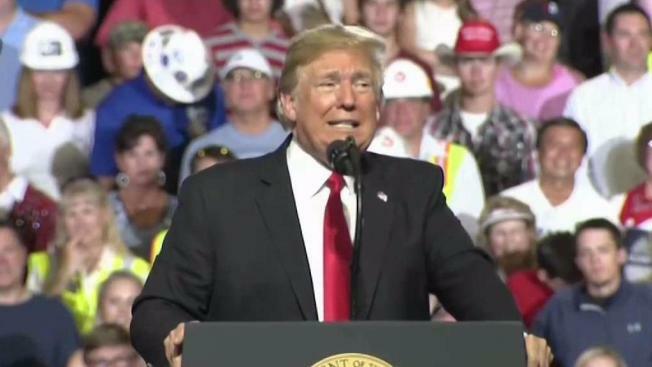 President Trump continued to go after Sen. Elizabeth Warren at a rally in Montana. In a freewheeling speech in Montana Thursday, President Donald Trump repeated his ridicule of Sen. Elizabeth Warren, one of the Democrats considered a potential 2020 candidate, for her claimed Native American heritage and even mocked the #MeToo movement. He again referred to the Massachusetts Democrat as "Pocahontas," deriding her for saying she has Cherokee heritage. Trump imagined being on a debate stage with Warren and giving her a DNA test to prove her claims of Native American ancestry. "I'll give you a million dollars for your favorite charity, paid for by Trump, if you take the test and it shows you're an Indian," Trump said to the crowd. "I have a feeling she will say no." The president also took aim at the #MeToo movement and said that he would have to give the test to Warren "gently" because of it. "We will take that little kit and say, but we have to do it gently because we're in the #MeToo generation, so we have to be very gentle," Trump said. "And we will very gently take that kit, and we will slowly toss it, hoping it doesn't hit her and injure her arm, even though it only weighs probably two ounces." Warren fired back at Trump's gibe Thursday evening, tweeting that he should "focus on fixing the lives" he's "destroying" instead of obsessing over her genes. Warren was referring to the Health and Human Services Department's announcement that it will use DNA to confirm parent-child links as it tries to reunite families separated at the U.S.-Mexico border as a result of the Trump administration's "zero-tolerance" policy. Pocahontas is a well-known historical figure who bridged her own Pamunkey Tribe in present-day Virginia with the British in the 1600s. Trump has repeatedly invoked Pocahontas as a way to denigrate Warren. The nickname is a reference to an issue that came up during Warren's run for Senate in 2012 against then-incumbent Scott Brown. During that campaign, law school directories from the Association of American Law Schools from 1986 to 1995 surfaced that put Warren on the association's list of "minority law teachers'" when she was teaching at the University of Texas and the University of Pennsylvania. Warren said she listed herself with Native American heritage because she hoped to meet people with similar roots. Warren has also acknowledged telling Harvard of her Native American heritage, but only after she had been hired. Warren, who is not enrolled in a tribe, has defended her ancestry claims and said in 2012 that they are based on "family stories" that she was part Cherokee. "I am very proud of my heritage," she told NPR. "These are my family stories. This is what my brothers and I were told by my mom and my dad, my mamaw and my papaw. This is our lives. And I'm very proud of it." More recently, in response to Trump's attacks she spoke about her background at length during a speech at the National Congress of American Indians in February. She said her father's parents "were bitterly opposed" to his relationship with her mother, whose family was part Native American. "The story they lived will always be a part of me. And no one - not even the president of the United States - will ever take that part of me away," she said at the time. She also said she respected the distinction between Native American heritage and membership in a tribe and contrary to claims by opponents, "never used my family tree to get a break or get ahead." "Every time someone brings up my family's story, I'm going to use it to lift up the story of your families and your communities," Warren said at the February event in Washington. Native American leaders have called Trump's "Pocahontas" insults about Warren offensive and distasteful, though not all Native American advocates embrace Warren's story. On Thursday, Trump also recycled his slams on another key Democrat, calling Rep. Maxine Waters, D-Calif., a "low-IQ individual." He pegged her level of intellect as "somewhere in the mid-60s," which is considered the range for a mental disability. Waters has been calling for his impeachment for more than a year.